Ayda Ruby is fully coded and in excellent condition. She has been sailed over from Ireland for the 2018 Noss Boat season and is an exciting upgrade from our previous boat, the Ayda Ruby I which we enjoyed during our first two seasons in 2016 and 2017. 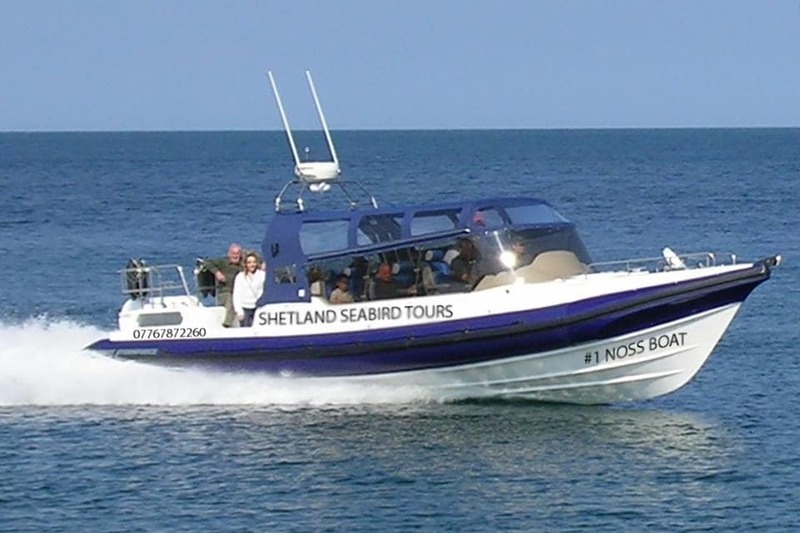 She is a perfect boat for small groups to get the best possible views of wildlife, comfortable, easily maneuverable, with a partial removable canopy cover (for those glorious sunny Shetland summer days! ), upholstered seating, backrests and superb Opticron binoculars for all. We have a large area “out back” to stand or sit out on deck to maximize unrestricted 360-degree viewing and photographic opportunities. She is powered by twin Yamaha 265 horsepower inboard engines. We have two inflatable life rafts stored on the stern of the boat and all passengers are required to wear modern, neat life jackets throughout our tours which are provided before embarkation and available for all ages. The Ayda Ruby II can really shift if she needs to – though our trips are not fast adventure tours, but slow, wildlife-friendly trips in a style and with an ethos we feel strongly about as naturalists. We can go smoothly and rapidly to the numerous good spots. She is available for skippered charter, prices start from £45.00 per person per day.